Thanks to all who came out and joined us for our biggest and best Flatfoot Flatbush to date!! Mother Nature was clearly looking out for us, since the rain stopped just in time for the event — musicians, dancers, and onlookers alike enjoyed a balmy 60 degree December parade! 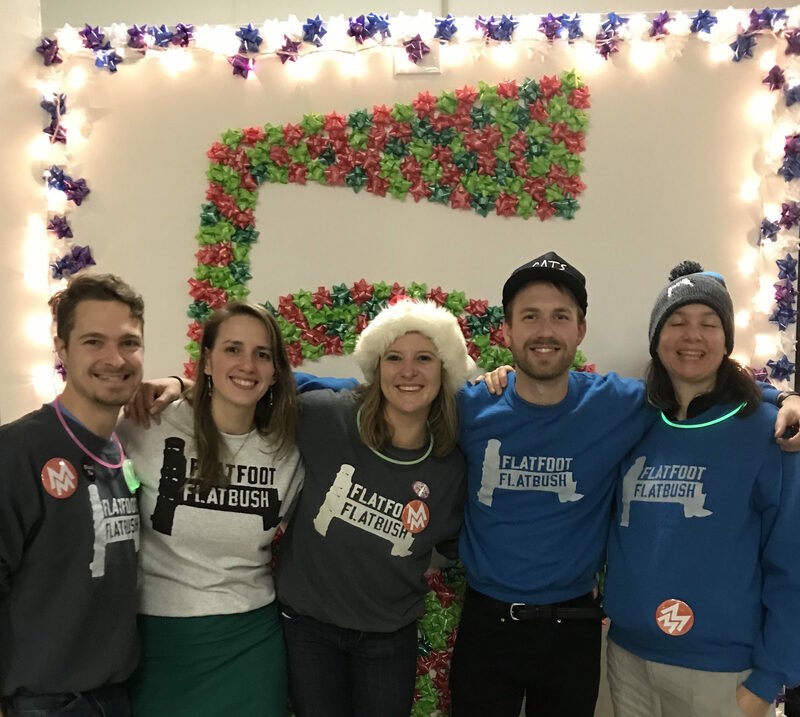 We started with a workshop at 354 Flatbush, followed by the parade kickoff at M&T Bank, where attendees were greeted with delicious cookies from Hungry Ghost. Afterwards, the parade moved to the corner of Flatbush and Carlton, where a few Brooklyn Conservatory of Music students showed off what they learned in their bluegrass jam class, and onlookers enjoyed soup and egg rolls from Autumn Asian. Next the parade progressed down Flatbush, making stops for “adult spaghetti Os” from Roses, winter pumpkin soup at Kombit, doughnut minis from Doughnut Plant, and the richest hot chocolate from Bklyn Larder. We celebrated the newly renovated 6th Avenue triangle with a line-dance across the triangle space, followed by carrot-ginger juice at Brooklyn Crepe. Finally, a parade through Oceans 8 took us to Antonio’s delicious pizza and a final dance, before heading back to 354 Flatbush for dinner from El Paso, drinks courtesy of Bluepoint Beer, dessert from Union Market, and lots more music!! Flatfoot Flatbush takes places every year on December 21st, as part of Make Music New York’s musical celebration of the winter solstice. Huge thanks to our partners Porch Stomp, the City Stompers, and Make Music New York for making this an amazing success every year! !